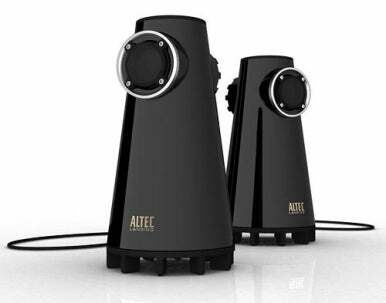 I previously reviewed Altec Lansing’s Expressionist Classic (FX2020) speaker system, finding it to be a stylish system that improves on a Mac’s built-in speakers, but falls short on the audio front compared to similarly priced systems. Thankfully, the company’s other Expressionist model, the $130 Expressionist Bass (FX3022) combines similar aesthetics with much-improved sound quality. Like the FX2020, the FX3022 is a 2.0 speaker system, meaning it uses only left and right speakers—no subwoofer. Compared to 2.1 systems—which include left and right satellites for higher frequencies along with a larger speaker/amplifier component that sits under your desk and produces lower frequencies—a 2.0 system takes up less room overall, but doesn’t usually provide the same kind of bass punch. That said, the Expressionist Bass, as its name implies, fares better at the low end than most 2.0 computer speakers. Altec Lansing’s Expressionist line emphasizes design, and the FX3022 is certainly unique-looking. Each glossy-black, 10-inch-tall speaker takes the shape of a truncated cone: a wide (5.25 inches) base, with the circular body narrowing to a 2.8-inch flat top. Each speaker has a mesh-covered, 1.5-inch driver on the front for midrange and treble frequencies. On the bottom of each speaker is a 4-inch, down-firing woofer. (The system provides 3.5 Watts of power for each of the smaller drivers, and 9 Watts for each woofer.) Opposite the smaller driver, in the back of each speaker, is a cylindrical protrusion that has the same retro, gear-like appearance as the rear of the Expressionist Classic. The overall look is a bit industrial, but I found it to be quite attractive. The back of the right-hand speaker provides a jack for the included AC adapter, as well as two stereo minijack inputs—one for your computer, another for a second audio source such as an iPod. The two inputs are mixed, so you can listen to both sources simultaneously, though only a single miniplug-to-miniplug cable is included. A five-foot, permanently attached cable connects the left and right speakers. You control the system’s volume, as well as turn the speakers on and off, using soft buttons on top of the right-hand speaker. The power button glows blue when the system is on. Given my experience with the Expressionist Classic, I expected decent, but not great, sound from the Expressionist Bass. But midrange and treble are solid with good relative balance, letting vocals sound full and rich while preserving a good amount of detail. Treble fiends may find the higher frequencies to be a tad recessed, but most people will enjoy the presentation. As for the low end, while these speakers aren’t small for desktop models, they certainly don’t look like bass monsters, no matter what the marketing blurbiage might claim. Yet I was impressed by how much of the low end they can reproduce—more than any other 2.0 desktop system I’ve heard. The FX3022’s bass output is relatively flat well below 100Hz, with decent bass response to around 80Hz. That’s impressive for 4-inch drivers, and at low listening volumes the system puts out truly enjoyable, and surprisingly balanced, sound quality. On the other hand, as with many small speakers that try to produce lots of bass, the FX3022’s low end has a tendency to sound a bit boomy, especially at loud levels. This is much less of an issue with classical and acoustic music than with music that has prominent bass, but with the latter, the thumpy upper bass can drown out the midrange and treble frequencies when you turn up the volume. The Expressionist Bass is a stylish speaker system that, thanks to an upright design and the lack of a subwoofer, won’t take up a lot of room on or around your desk, but still provides the kind of low-end response you don’t generally get without a bulky sub. Its ability to produce rich, near-full-range sound at low listening levels will appeal to those who prefer quiet volumes and those who listen to classical and acoustic music. Those who prefer thumping bass will also like the system, especially at higher volumes. On the other hand, that accentuated low-end performance means this isn’t the most balanced system out there, and those who aren’t fans of heavy bass may tire of the FX3022’s focus on the lower frequencies if they crank the volume too loud.